On May 30th my sweet friends, Cara and Matt Paxson, welcomed 8lb 9oz of pure sweetness to the world. Meet baby Dean Paxson. 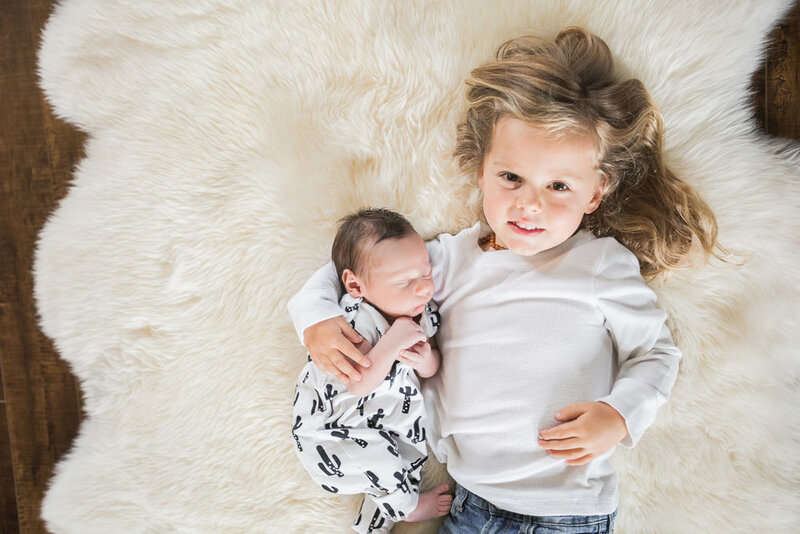 This little one was a welcome addition to the Paxson family and his big brother Waylon was over the moon when he met his new baby brother. If you haven't seen them already, check out Cara's maternity session in Ocotillo Wells. Waylon was so excited and all about his mommy's tummy and it perfectly aligns with Dean's Desert Nursery theme. One really cool detail in Dean's room, is the moon water color print his grandma made him. This moon print echo's back to the maternity shoot as well, where at the end we got the moon rise and the sunset at the same time. This darling little nugget was one of the most relaxed and chill babies I have ever met, especially considering he was only 12 days old when we did our newborn session. He didn't cry once, and slept 90% of the time I was there. He was patient with me changing his outfit a bunch of times and really all he wanted was to be held and fed. He even slept through his 3 year old brother holding and kissing his face. He was a dream and it made our in home lifestyle session so fun and comfortable. And he looked so sweet in his beautiful nursery, and his adorable cactus romper (I wish adults looked cute in rompers like this, I would totally wear one ). One of my favorite parts of our session was taking photos with his moms Pregnancy crystals. Cara slept with these stones every night to help support a healthy pregnancy and fetal development, as well as to feel closer to Dean. Cara owns her own business (Asiia by Cara) were she makes amazing candles and each of these candles comes with it's own stone or crystal, so she definitely knew the right stones to help promote a healthy pregnancy. Each crystal helps the mother and fetus in a different way. Moonstone - to relieve stress, Unakite - support for the reproductive system and the bodies communication with the baby. Azure - to help repair brain cells and fetal development. Chrysocolla - draws off negative energies. Red Jasper - Helps boost Energy. Cara (and Matt), thank you for welcoming me into your home to document this sweet moment in time. These days go by so quickly and I hope you not only love these images now, but treasure them forever.